A Whale’s Tale in the Phoenix Islands: "Whar" She Blows? Following up on the theme posted in March 2012, this is a guest post from Erin Taylor, New England Aquarium Conservation Department projects assistant on the Phoenix Islands Protected Area initiative. In a series of posts she shares research on 19th century sperm whaling in the Phoenix Islands. This careful examination of whalers' log books, maps and historic whale distributions may help researchers studying sperm whale populations in Kiribati today. Imagine you are a 19th century American whaler. You have a boat, you have a crew, you have a vast ocean stretched out in front of you. Now it’s time to find a whale—the needle in a very, very big haystack. Where in the world do you go? Flash-forward to today, and you would have a variety of instruments available at your fingertips to answer this question: GPS, radars, navigation software all now exist to make finding whales and sailing around the ocean ‘a breeze.’ But clearly, 19th century New England whalers were not so technologically fortunate. Instead, the historic whaling industry came to rely on wisdom from vessel logbooks kept by whalers during their long voyages. By studying these vital logbook records, whalers came to know of promising global whaling grounds, including the ‘on-the-line’ grounds that stretched through the Phoenix Islands. For anybody looking for sperm whales in the 1800’s, the message passed on from the logbooks was clear: head to the Pacific. Considering modern research generally confirms the presence of sperm whales (in particular females and young males) in equatorial waters of the Pacific year-round, placing your faith in logbook records as a 19th century whaler wasn’t a bad bet. So what exactly was in these logbooks? Generally, logbook records documented the daily happenings of whalers at sea. This included where (via coordinates) and when (via dates) whales were sighted or hunted—or where and when they weren’t. If a hunt was successful, the logbook record featured the number and species of whales killed that day. 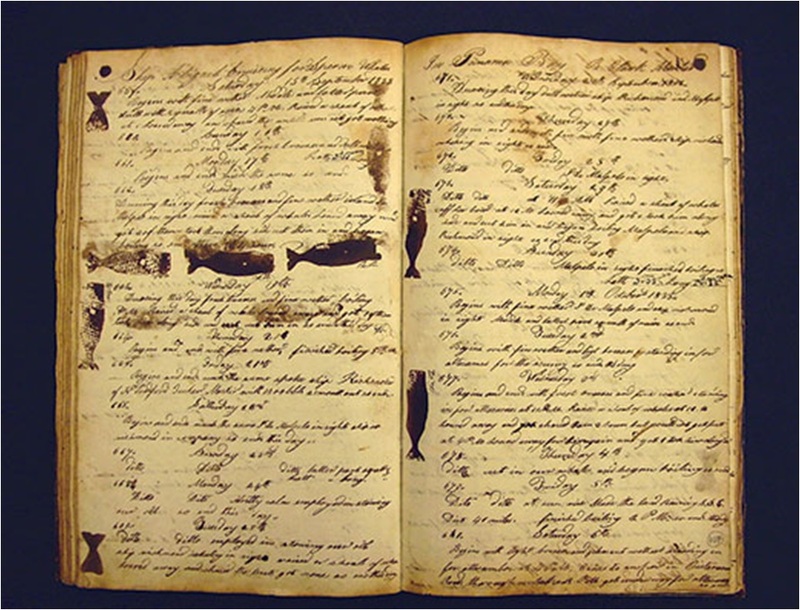 Though logbooks were initially used only for economic purposes by those in the whaling industry, scientists also started to utilize the wealth of information contained in these records in the mid-nineteenth century, at the height of global open-boat whaling efforts. 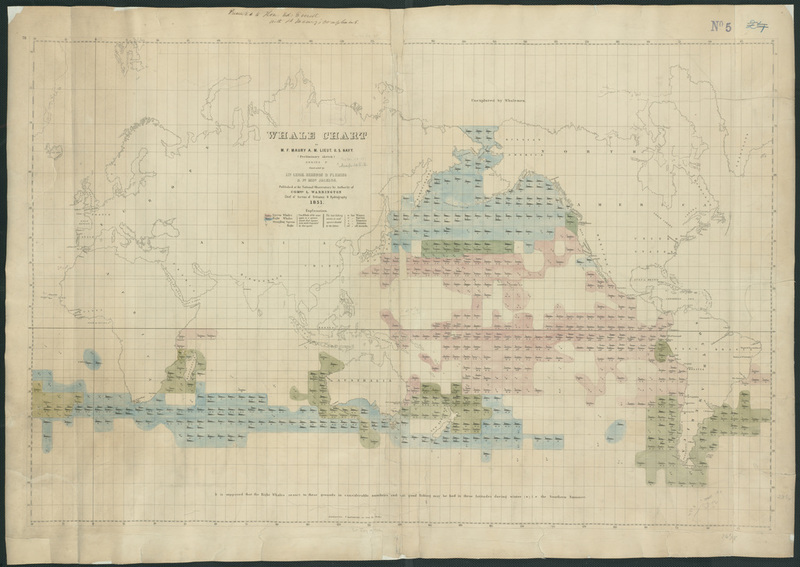 In the 1840’s, Matthew Fontaine Maury, a commander in the U.S. Navy, was the first to use logbook data to create whaling maps, resulting in visualizations of global whale distributions that were invaluable for studying whale life history. Diligent economic record keeping turned powerful scientific tool. Maury’s efforts were continued in the 1920’s by Charles Haskins Townsend of the New York Zoological Society. Townsend gathered the logbook records of over 1,600 American whaling voyages carried out between the late 18th to early 20th centuries to create his own maps displaying global whale distributions and migrations—maps that were much more user-friendly and comprehensive than those of Maury’s study. Map by Charles Townsend of the "On The Line" whaling grounds that followed the equator in the Central Pacific. After these two initial efforts, studies capitalizing on historic logbook records fell largely dormant until a new study led by Dr. Tim Smith of the World Whaling History Project emerged just last year. Smith et al.’s study brought new life to this field of research by creating whale maps with modern Geographic Information Systems technology. Looking at both current and historic maps, one can clearly see just how important the regions surrounding the Phoenix Islands and central Pacific in general were for sperm whalers year-round, as these areas are thick with dots denoting sperm whale activity. 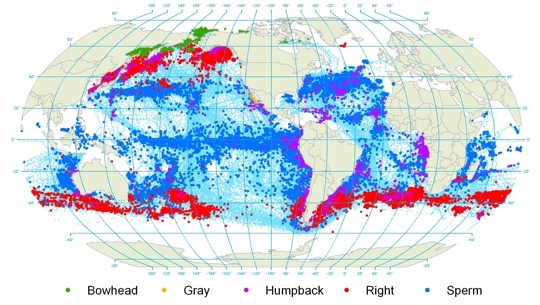 Daily locations of vessels from a sample of American whaling logbooks mapped using GIS software and published in Smith TD, Reeves RR, Josephson EA, Lund JN (2012) Spatial and Seasonal Distribution of American Whaling and Whales in the Age of Sail. PLoS One 7(4):e34905. These maps reveal many important patterns in the historic migrations and distributions of a number of whale species and will feed into plans for current whale research and conservation objectives. Stay tuned for what GIS maps of historic sperm whaling in the Phoenix Islands reveal as we ask questions about why this region might have been historically such a whaling ‘hotspot’. Nice job Erin! Cool post!